The international federation F.C.I. will organize from 26th till 29th of January 2012 the Continental Cup in Budapest, Hungary. 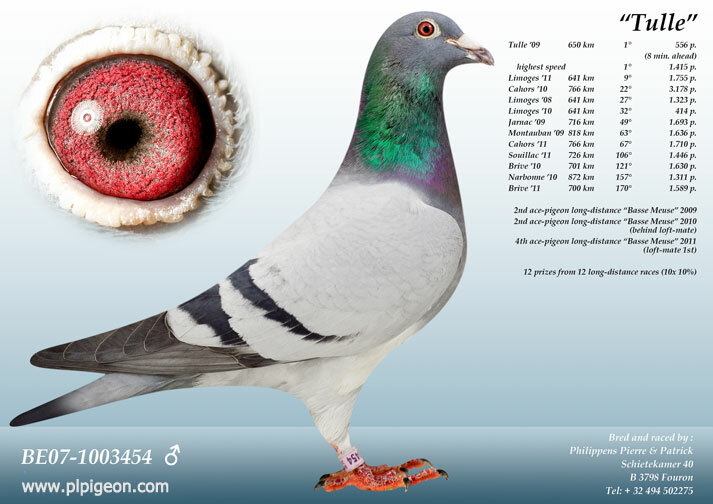 The sport pigeons who represent their country are selected according to the same rules than Olympic pigeons, i.e. according their best results over the last two years, 2011 and 2012. We have the honour to represent Belgium with two pigeons. “Golden Eye”, 1000322/2009, our 2nd national ace-pigeon long-distance K.B.D.B. 2011, is selected as Belgium’s 1st in the long-distance category with 6 best prizes above 500 km over 2010 and 2011. “Tulle”, 1003454/2007, our long-distance favorite with 12 prizes out of 12 long-distance races, is selected as Belgium’s 1st best in the marathon category with best 4 prizes above 700 km over 2010 and 2011. 8 Olympic pigeons, 5 Europa Cup pigeons and now 2 Continental Cup pigeons. In the sport category, we obtained for Belgium already following top-3 positions: 1st, 1st, 1st, 1st, 2nd, 3rd, 3rd, 3rd, 3rd and 3rd. “Tulle”, national 1st in the marathon category for the F.C.I. Continental Cup in Budapest, participated also in the 3rd national loft championship long-distance K.B.D.B. 2011 and the 7th national loft championship long-distance K.B.D.B. 2010.